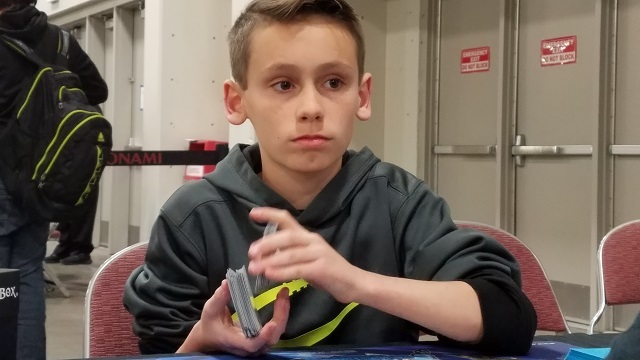 Austin Marden, from West Jordan, UT, won yesterday’s Dragon Duel event. Las Vegas’s Diego Diaz took second in that event but managed to come back and win today’s! 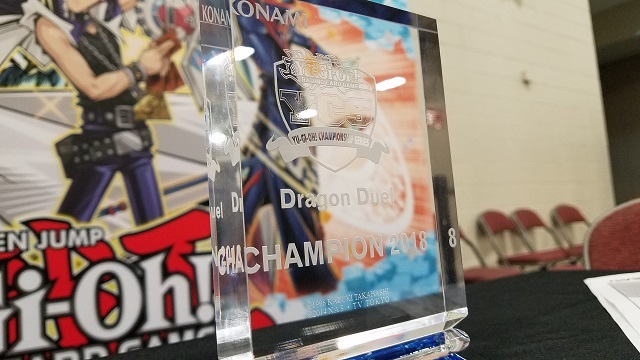 Diaz is an experienced Duelist, having multiple Dragon Duel Championship trophies already. Marden, however, is a very new Duelist – he’s only been playing for two months! It’s certainly impressive that he was able to take first yesterday, showing that he’s got a strong understanding of the game. The regular Dragon Duel tournaments use Battle Pack Sealed Decks, but this Match will be played with Advanced Constructed Decks. Diaz may have an edge here, because he’ll have more experience with these cards. 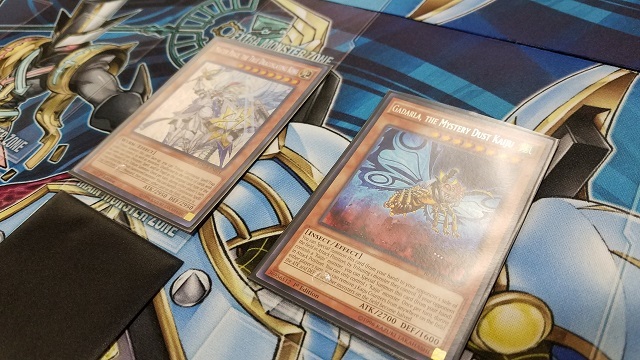 He’s using a True Draco Deck, while Marden is using his Blue-Eyes Deck we saw in his Main Event Feature Match. Diaz won the die roll and chose to play first. He had a hand of Solemn Judgment, Dragonic Diagram, True King’s Return, Terraforming, and The Monarchs Erupt. He started with Diagram, destroying Terraforming to search out Ignis Heat, the True Dracowarrior. He Set True King’s Return and Tributed it for Ignis Heat, then Set Solemn Judgment and The Monarchs Erupt. Marden Normal Summoned Maiden with Eyes of Blue, then used the effect of Sage with Eyes of Blue in his hand. Diaz flipped up The Monarchs Erupt to negate Maiden. Sage Special Summoned Dragon Spirit of White. He played One for One, discarding The White Stone of Ancients to Special Summon a Sage with Eyes of Blue. He tuned Sage to Dragon Spirit for Blue-Eyes Spirit Dragon, and Diaz flipped Solemn Judgment to negate the Summon. Marden played Monster Reborn, bringing back Dragon Spirit. He had it attack, but he forgot about the 300 ATK boost from Dragonic Diagram! Dragon Spirit lost the battle. Marden used the effect of The White Stone of Ancients to Special Summon a Blue-Eyes White Dragon, and Diaz used Ignis Heat to get True Draco Heritage into his hand. Diaz drew Lose 1 Turn. He had Diagram destroy Lose 1 Turn, adding Master Peace, the True Dracoslaying King to his hand. He activated Heritage, Tributing it and Ignis Heat for Master Peace. Its effect destroyed Blue-Eyes, then it attacked directly. Marden banished The White Stone of Ancients from the Graveyard to get Blue-Eyes into his hand. He discarded it to play Trade-In, then played The Melody of Awakening Dragon! He discarded another The White Stone of Ancients to add Blue-Eyes White Dragon and Blue-Eyes Alternative White Dragon to his hand! He Special Summoned Alternative White Dragon. He used The White Stone of Ancients in the End Phase to Special Summon a Blue-Eyes in Defense Position, and Master Peace destroyed Alternative White Dragon. Diaz drew Pot of Duality. He played it, revealing Amano-Iwato, Disciples of the True Dracophoenix, and Diagram. He took Disciples and destroyed it with Diagram, adding Majesty Maiden, the True Dracocaster to his hand. 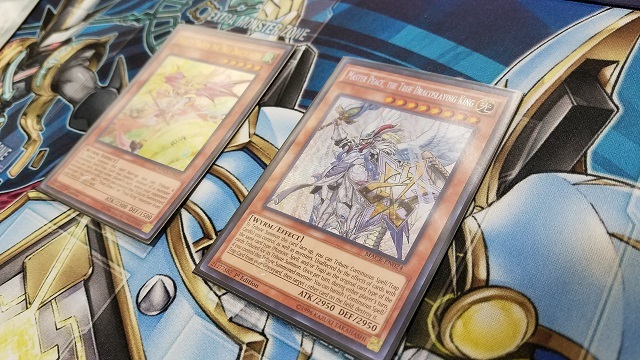 Master Peace’s effect destroyed Blue-Eyes White Dragon, then Diaz Tributed The Monarchs Erupt to play Majesty Maiden. Marden was wide open – Diaz’s True Dracos attacked to take the first Duel! Marden played first this time. He played The Melody of Awakening Dragon, discarding Alternative White Dragon to add another Alternative and a Blue-Eyes White Dragon to his hand. He Special Summoned Alternative and Set a card in his back row. Diaz had two Heritage, Disciples, Majesty Maiden, Master Peace, and Amano-Iwato. He Normal Summoned Amano-Iwato, played Heritage, and used Heritage to Tribute Summon Majesty Maiden. When Heritage went to the Graveyard, it destroyed Marden’s Set Silver’s Cry. Diaz played Disciples and used that, Tributing Disciples and Amano-Iwato to play Master Peace. He activated Heritage to draw The Monarchs Erupt, and Set it. Master Peace destroyed Alternative White Dragon with its effect, and both True Dracos attacked directly. Marden played Cards of Consonance, discarding The White Stone of Ancients. He banished The White Stone of Ancients to add Blue-Eyes Alternative White Dragon to his hand, and Diaz used Majesty Maiden to add another Master Peace to his hand. Marden played Sage with Eyes of Blue, and Master Peace destroyed Sage with its effect. Marden revived his Alternative White Dragon with Return of the Dragon Lords, and it attacked and destroyed Master Peace in battle. Diaz drew Interrupted Kaiju Slumber. He Tributed Majesty Maiden and Heritage to play Master Peace, then activated Interrupted Kaiju Slumber! Master Peace was unaffected by the Spell, but Alternative White Dragon was destroyed! Diaz played Gadarla, the Mystery Dust Kaiju to his side of the field, and Gameciel, the Sea Turtle Kaiju to Marden’s. Gadarla destroyed Gameciel, and Master Peace finished Marden off! 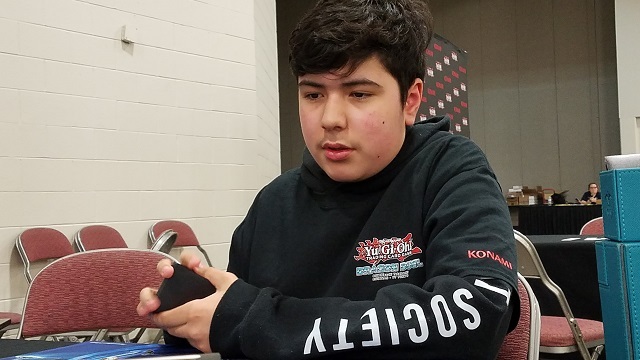 Diego Diaz is your YCS Salt Lake City Dragon Duel Champion!